You must have heard many times that Digital Marketing jobs have higher salaries. But do you think it is true? One thing is bang on correct that the field of digital marketing is on boom these days and it will a higher demand in the near future. Those who are aiming for a digital marketing career are definitely going to succeed as the high paying digital marketing jobs are waiting for you. With every brand fighting for digital supremacy now, the digital marketing agencies have a lot to offer. The field needs a lot of creativity and those who have it in themselves are a perfect fit in this field. So now you must be thinking there are other careers as well like MBA, engineering etc which are helpful in finding good jobs. So why digital marketing? Let’s take a look at that as well! The change in consumer behavior has been very fast in the past 3-5 years. You can see the change all around you. Millions of consumers are using the internet. There are more than 400 million internet users in India right now. The internet usage has been accelerated by the penetration of smartphones and low-cost computers. The world is going Digital and by the year 2020, all the companies around the world including India will have online presence and thus creating a lot of career opportunities. It is a progressive field. With technology developing every day, you have to continuously develop your digital marketing skills so that your career keeps growing. According to a research by the Irish government, the digital economy is growing 10 times faster than the traditional economy. The firms that engage in online trading are twice as likely to be creating jobs as firms that aren’t. 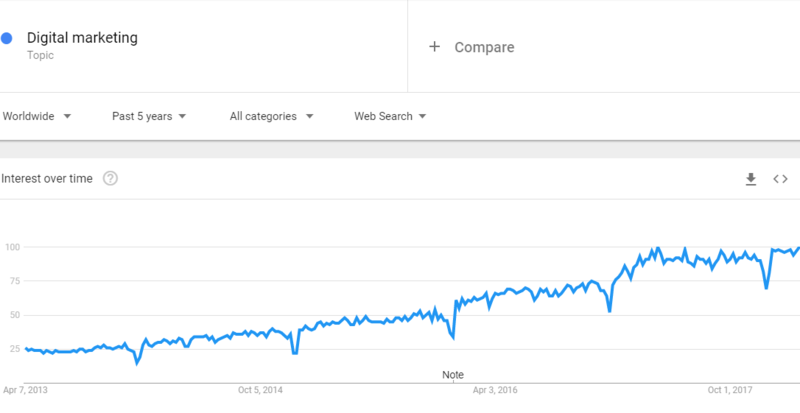 As you can also see the graph that how much demand the field of digital marketing has. Even if compared to last 5 years, there is a drastic change that can be seen. Also, many educational institutions are coming up with different digital marketing courses. The courses are specifically for those who want a digital marketing career. According to a report by Kstart and YourStory, the digital marketing industry is growing at 40% year-on-year as compared to 5-6% growth in many other industries. According to the report, for Startups, digital marketing is a more viable option than traditional media. Because even with a small budget, businesses can test the effectiveness of their marketing strategy, control costs, and reach out to targeted prospects. It’s why every type of business (big and small, old and new) is recognizing the importance of leveraging digital marketing. Not surprising then, that the digital media industry is growing at 40% y/y growth when other industries are struggling at 5% or 6%. 66% of respondents believed that finding good talent was a major bottleneck because a very few people ‘get’ digital marketing. Others felt there wasn’t enough talent in the market. Companies are clearly feeling a shortage when it comes to hiring talented digital marketers. The survey findings make it clear that the jury is still out on that one. Survey results showed that 46% work with digital agencies to execute their marketing strategies, and an almost equal number (43%) work with freelancers. It is needed for every brand to have good digital marketers on board in order to increase their online presence. Also, they are ready to pay a good amount of salary to them. This is because the investment in digital marketing is very much less than that of traditional marketing. And here the expertise and skills are mostly in demand which is rare. Small companies may need one or two digital marketing experts bt large companies need a team of digital marketing or they can outsource it as well. 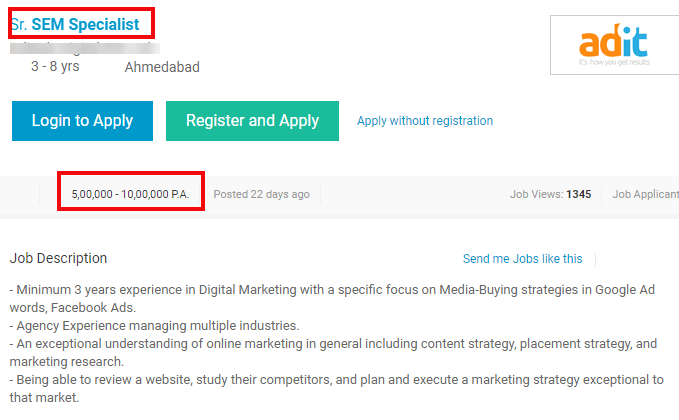 There are many websites that provide jobs related to digital marketing that obviously have the packages of more than 10 lakhs per annum. Also, there are a lot of options available for work from home. Digital marketing is that kind of a field where one can work from anywhere as all work is done online. 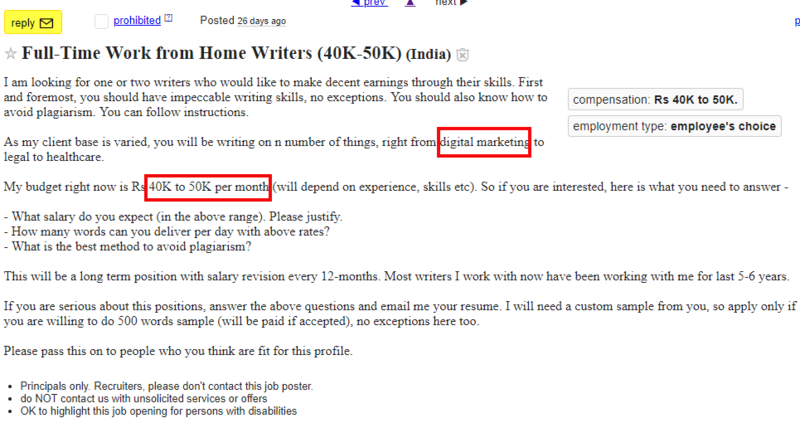 Below is a screenshot of a job offer from Craigslist for a content writer that is work from home. The monthly salary they are offering is around ₹40000-₹50000 which a decent amount. If considering the digital marketing career, then skills hold a lot of importance. Along with skills, the experience also counts a lot. It is not about age factor here. But how much you have done in digital marketing that matters. 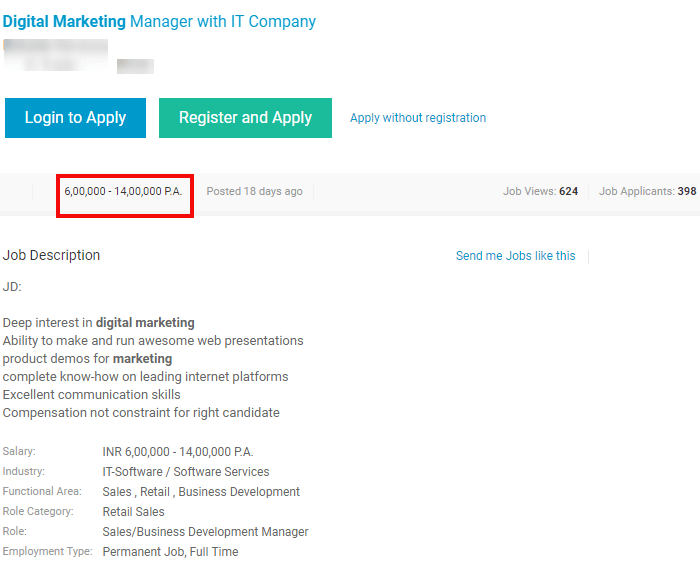 In the above screenshot, you can clearly see the salary that the company is offering along with the required skillset. The salary of these positions differ with years of experience, the kind of company that is hiring and most importantly, the city in which you work. But I can confidently say that the salaries are definitely higher than other fields where the supply is more than the demand! The managerial level salaries are definitely going to be higher as that amount of experience is needed for that. And also the salaries vary from sector to sector. The higher level of salaries can be expected if you are going to a digital marketing position with an IT company. If you are working in a digital marketing agency then, there will a higher salary package for project managers and team leaders. So it depends on company to company as well. 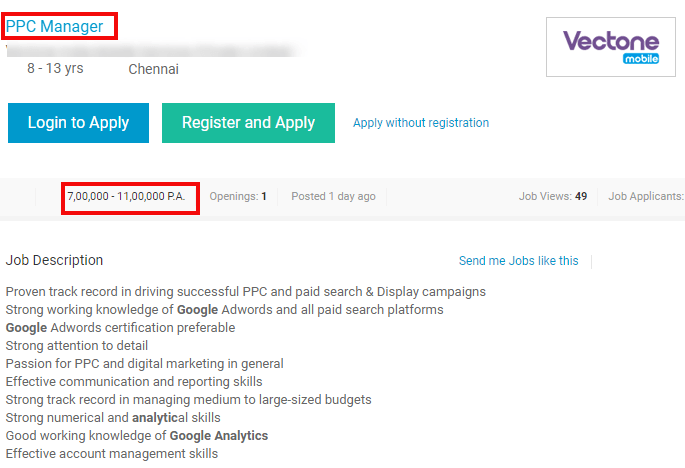 In the above screenshot, you can see that the average salary offered for the position of senior SEM specialist is between 5 lakhs to 10 lakhs with a minimum experience of 3 years. This is a good one because no other field gives this much of heavy package to a person with just 3 years of experience. This does have a huge demand in the digital marketing field. If you are looking for a job in this field and has an expertise in Google analytics then you must go for Pay Per Click Manager. The salary is just great. 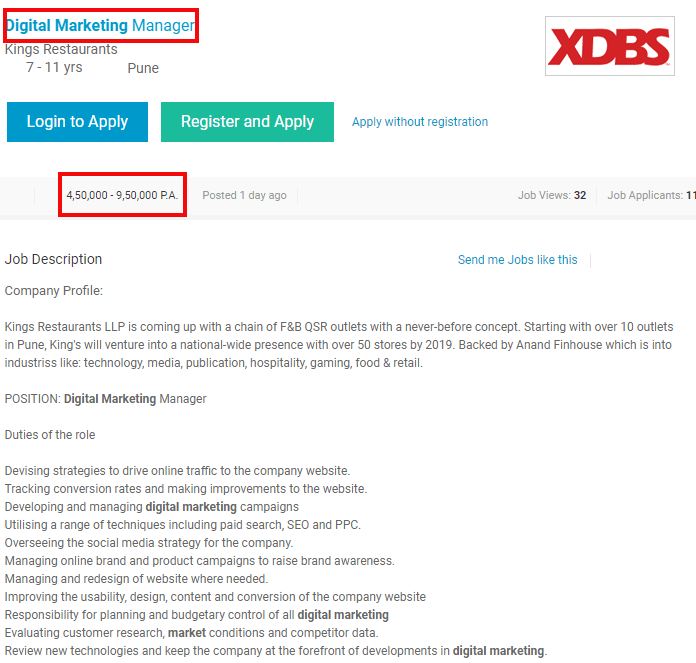 If considered the average salary of digital marketing manager then it is around ₹5,00,000 which is fair enough, according to PayScale. So, now that you know the overall scenario of the digital marketing jobs and digital marketing career, then you can arrive at some decision. The high paying digital marketing jobs are indeed a perk that you would like to have. But along with this, there are several other elements that make the field of digital marketing a blessing to work in. The flexible type of work, timings, work from home policies, freelancing work, there is a lot in store when it comes to the digital marketing career. You can also become a self-made digital marketing expert and go to places. What are you waiting for then? Grab the opportunity today and become a digital marketing specialist. I’m not a Lakh earner, but I sure enjoyed the read.